In the hot days of summer, Rhubarb is a plentiful treat. Spice up your morning ritual with these delicious and sweet Rhubarb muffins that are as healthy as they are delicious! Diced rhubarb and vanilla yogurt are baked into a sweet and tender muffin and topped with a crunchy almond topping. Make a batch for a weekend brunch or a weekday snack and watch how fast your entire family eats up these healthy and delicious rhubarb muffins! 2. In medium bowl combine yogurt, 2 Tbsp melted butter, oil, and egg. Beat until well combined. 3. In another bowl combine ¾ c. brown sugar, flour, baking soda, and salt. Combine with wet ingredients until just moist. Fold in rhubarb. 4. Spoon into muffin tins, filling cups until at least 2/3 of the way full. 5. In a small bowl combine ¼ c. of brown sugar, cinnamon, nutmeg, almonds, and 2 Tbsp melted butter. Spoon over the tops of the muffins. 6. 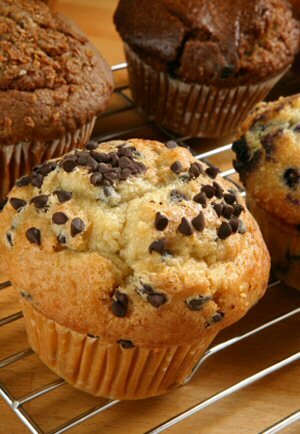 Bake for 25 minutes until a toothpick inserted into the center of a muffin comes out clean.